I was not eager to emerge from the cozy confines of my little pyramid-tent this morning. The crisp air – carrying the coldest temperature of the trip thus far – wasn’t penetrating my quilt. Being encapsulated it it, with my head hidden inside the puffy hood of my anorak, gave a rather pleasant feeling of warmth and security I didn’t really want to exchange for the chance to click a shutter button during the golden hour. Nevertheless, the panic of wondering if this is the final alpenglow I may ever observe (a panic I feel every morning I’m waking up on the eastern side of a mountain crest) motivated my actions and I was soon hopping lakeshore talus with camera in tow to find a more perfect vantage point from which to convey the imagery of this majestic basin to those not fortunate enough to be here this morning. Satisfied that I had achieved this short-term photography mission, I returned back to my tent, started a pot of hot water, and crawled back into my soft down cocoon. Soon a plume of steam was billowing from the little hole in the top of the pot, so I snuck an arm out to shut off the gas, added the coffee, and started the brew. I withdrew the arm, tucked the quilt wings around my shoulders, and closed my eyes, perfectly content to allow the coffee to brew itself with no help from me. Minutes later, as the sunlight began to kiss the very tip of my pyramid home and cast its pointy shadow westward, I took the first glorious sips and felt the surge of caffeine course through my groggy brain, and with it, the excitement of the unknown that comes with a new day of wilderness living! I started my morning routine with some reading (an essay by Leopold and journals from T. Roosevelt’s wild descent of the “River of Doubt”) followed by a long session of writing – my own journals, then gear notes and finally the text of an article for Backpacking Light about technology in the backcountry. I walked over to the lakeshore and found a pod of trout swirling and making the most delicate dimples in the surface I have ever seen. Not once did I see a brookie’s snout break the surface film, nor did I see insects on the surface. I was baffled. Then, remembering my age, I pulled my folding reading specs from the pouch that holds my miniature fishing tackle kit, put them on, got on my stomach, and brought my face to within a few inches of the water’s surface. Here, as if I crawled through a wormhole into another dimension, I found an ecosystem only millimeters high and teeming with life: countless little midge flies in the surface film. Some of the little worms were below the surface, twerking madly in their struggle to break out of the underwater world and fly free. Others were stuck in their shucks in the film itself, entrapped by capillary forces of such magnitude that this would be their cause of death. Others, a small fraction only, had made the full transition and were standing on top of the water, fluttering a wing here and there to dry out before they took flight. The size of the adult flies were not more than two millimeters in length. After peering into my fly box, and realizing that my smallest fly, a size #22 CDC midge, was large enough to mimic a terrifying predator of the flies that were actually hatching, I had no choice but to laugh and let the trout be, allowing them the peace to snack on their little mustard seeds without my intrusion. I also watched a chipmunk for quite some time this morning and observed an unusual display of relaxed playfulness that I did not normally equate to this quirky creature, which would seem better off as the poster child for a Xanax publicity campaign. I associate chipmunks with constant anxiety, confusion, chaos, and fear. How can an animal with a heart that beats two hundred times per minute be anything but? Nevertheless, the little creature I observed this morning may have gotten into a stash of some sort of therapeutic wilderness herb he’s not telling his friends about. Five yards in front of my tent was a cluster of tall grasses with seed pods at their crest. The chipmunk scampered to the base, looked up, and seemed very excited to have discovered breakfast. He tried to nibble the base of the stalks to bring the timber crashing down, but this proved to be too much work, the cellulose being too tough and stringy for recreational chewing, I suppose. Instead, he hunched down like a coyote getting ready to pounce on a mouse, and began to twitch and flutter, with its hind end swaying to and fro. Then without warning, he converted the potential energy stored in his quads and glutes to vertical flight, launching his body upward more than a foot off the ground. Although his aim was imperfect, like a trapeze artist he managed to grab the top of the stalk on the way down with his little hands and ride its bending pole to the bottom, landing slowly and gracefully. He then nibbled away at the seeds, released the stalk (now bare) with a fling to its original position, and then rolled, spun, and hopped in apparent glee before repeating the process over and again. We left camp in the late morning just as the sun was cranking up its heat. We immediately started walking uphill, aiming for a low pass in the ridge dividing the Davis and Thousand Island basins. I desperately wanted to avoid the JMT (John Muir Trail) and stay off trail, just for principle, and we successfully gained the ridge via a steep grass-and-talus notch to the west of where the JMT crossed. During the climb, inspired by the fact that much of Muir’s exploration here was fueled mainly by bread and tea, we engaged in a lengthy discussion about applying the principle of reductionism to backpacking food. We agreed that a few bulk ingredients would satisfy most of our emotional and physical needs, but also decided that we weren’t the hard men that Muir proved to be. After reaching the crest of the ridge, we made a long diagonal traverse back down to the upstream end of Thousand Island Lake where we took a long break and successfully fished for large rainbows there. We then ascended our final divide of the trip – the low and easy pass dividing Thousand Island from Garnet Lake. In the headwaters basin above Garnet, we picked up our gear cache that we’d left a week before, retrieving the stash from beneath a massive glacial remnant in the middle of the braided creek, hidden by piles of stones. We then walked down to the head end of Garnet Lake, where we are camped tonight in an expansive meadow adjacent to the lakeshore. Banner Peak’s majestic east face is behind us and the mini-ocean of the island-pocked Garnet Lake is in front. On our last night on the trail, we are at yet another place of such awe-inspiring beauty that I cannot hope to convey in words what it’s like here. We spent the evening swimming and fishing, the latter activity providing us with a gourmet meal fit for a king. After steam-baking the trout to separate its meat and bones, I added a garlic-and-pepper spice base, olive oil, and rehydrated shiitake mushrooms, leeks, shallots, and cabbage, fried the mixture to a state of mild crispness, and spooned it into flour tortillas for the finest brook-and-rainbow fish tacos the world has ever seen. As I get ready for bed, the night air is even crisper than last night’s, and I can see the exhaled mist of my breath. Between the cold air and changing color of the tundra from greens and yellows to reds and purples, I get the sense that fall will be coming to these mountains very soon. We have had a great time out here and it comes with no shortage of bittersweetness that we walk “out” tomorrow. To be reunited with Stephanie is always something I look forward to and I’ve missed her fiercely for the past 10 days. But to say that I feel most at home and at peace in the mountains, living the rhythms dictated by sunrise and sunset, would be a gross understatement. To have to go back to the noisy, confusing, complicated, and demanding first world where I spend most of my time gives me no shortage of anxiety and trepidation. I will miss these mountains and I’m grateful for the time spent here, and for the intimate moments shared with trekking companions and friends of the highest caliber, Daniel and Chase. 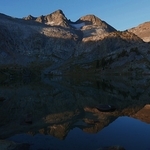 – Sunrise in the Davis Lakes Basin. 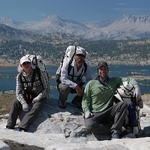 – Chase, Ryan, and Daniel at the Thousand Island-Garnet Divide. – Chase with a nice Garnet Lake Brookie.